HABIT: Climbing vine that needs support to start. Profuse yellow flowers in the early spring. Will sometimes bloom during warm spells in winter¡ªno problem. CULTURE: Well-prepared soil, good drainage, moderate water and fertilizer. Top of plant sometimes needs thinning to prevent a large mass from forming. Will grow in shade but not bloom well. 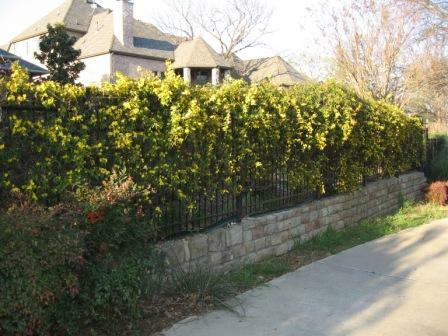 USES: Climbing vine in full sun for arbors, fences, walls, screens. Early spring color. Should not be used as a groundcover. PROBLEMS: All parts of plant are poisonous, but not to the touch. Warn the kids not to fool with the flowers. NOTES: Is not a jasmine. Native to East Texas, Florida, and Virginia. Note from a Reader: “The Longest Carolina in the World”, right here in Dallas, Texas.